Unique partnership provides more access to fresh fruits and vegetables for food stamp recipients. NEW YORK CITY — Constance Milstein, chairman of the Humpty Dumpty Institute (HDI), today announced a $125,000 grant to the Farmers Market Federation of New York to provide 25,000 food stamp recipients in upstate New York with incentives to double their purchases of fresh, locally grown fruits and vegetables at 43 farmers markets. This pilot program breaks down traditional barriers for food stamp recipients and expands their use of EBT cards at farmers markets in upstate counties to purchase fresh, healthy fruits and vegetables. 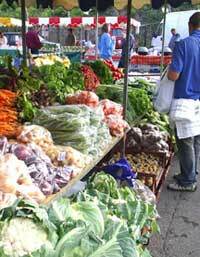 Beginning in the 2008 market season, food stamp recipients who spend $5 dollars on fresh fruits and vegetables will receive an additional $5 dollars in matching funds. "This program has a double impact. It not only encourages food stamp recipients to purchase more fruits and vegetables, but also benefits New York's small family farmers," said Constance Milstein. She continued "We are very excited about this innovative way to link the thousands of upstate food stamp clients to additional fresh, local, healthy New York State fruits and vegetables with hundreds of our hard working small produce farmers selling at farmers markets." HDI is a Manhattan-based Institute that forges innovative public-private partnerships to find creative solutions to difficult humanitarian problems through a series of unique programs. Currently, HDI's mandate is to improve U.S.-U.N. relations, to remove landmines around the world, and to help alleviate domestic and international hunger. To learn more about HDI's international programs, please visit www.thehdi.org. Additionally, a number of other foundations are also part of this effort. "Newman's Own" Foundation has granted $5,000 to the project on behalf of Wholesome Wave, a non-profit organization that manages similar initiatives including the Green Wave Farm-to-College program in Poughkeepsie, NY, the Westport Farmers Market project, and the Staples High School Edible Mentorship program also in Westport, CT.
For Immediate Release For more information, please contact Ralph Cwerman at 212-944-7111.